Wolves likely can readily associate the sound of gunfire with an easy meal in the form of the gut pile that remains after hunters field-dress their quarry, says a wolf expert. Wolves are likely to associated hunters’ gunfire with an easy meal. Some years ago, I hunted in northern British Columbia. A young man was my guide, and during a long first day, we climbed into high, rugged country on horseback, trailing two pack horses. The area was rife with moose, elk, wolves, and grizzlies. Headquartering in an abandoned trapper’s shack, we hunted all day, saddling the horses before sunup and riding out in the dark. At night we hobbled the horses’ front feet and turned them out to graze, stringing cowbells around their necks so we could find them in the morning, and to keep bears away. One day we spotted a moose from a distant ridge. We rode a while toward the animal from downwind before tying the horses and hiking. The moose wasn’t a trophy, but was a legal target, bearing the required brow tines. When the big animal showed itself while ambling through tall willows, I braced my .270 against a tree and collapsed him. Soon the guide and I convened alongside the moose. We had heard wolves howling, but hadn’t seen any. 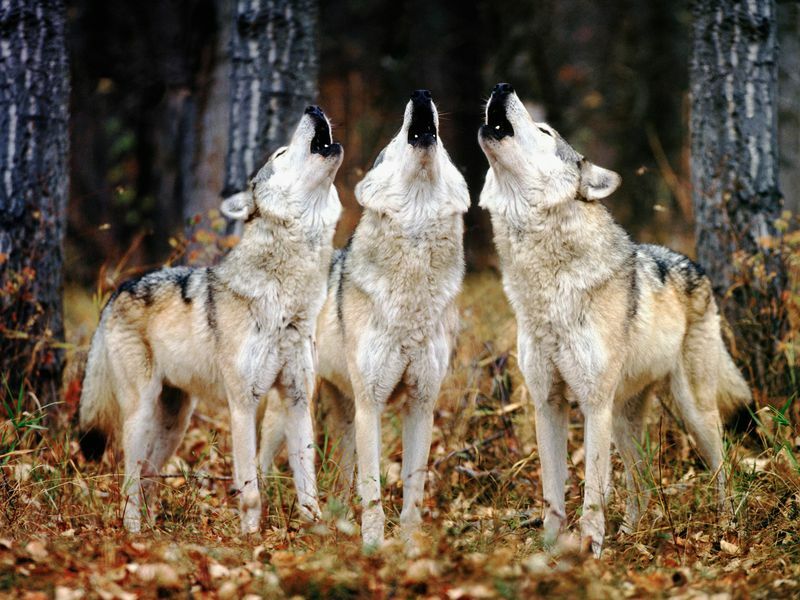 Wolves likely can readily associate the sound of gunfire with an easy meal in the form of the gut pile that remains after hunters field-dress their quarry, said wolf expert Dave Mech, a senior scientist with the Biological Resources Division of the U.S. Geological Survey and an adjunct professor at the University of Minnesota. This fall, the International Wolf Center in Ely alerted Minnesota whitetail hunters that they may encounter one or more of the state’s nearly 3,000 wolves “staring” at them in their deer stands. Hunters’ use of deer scent might also attract wolves, the center said. As deer hunting winds down, some wolves in the northern portions of Minnesota and Wisconsin are ending their own special seasons of gut-pile indulging. In most instances, consumption of these remains by wolves occurred unbeknown to the hunters who killed and field-dressed their animals, then left the woods. But some deer hunters this fall did encounter wolves up close and personal, including Steve Patterson, 26, of Minneapolis, who arrowed a 208-pound buck in northern Wisconsin on Nov. 11. Patterson killed the nontypical 10-pointer in late afternoon in an area where wolf sightings are common, with images of the animals showing up frequently on hunters’ trail cameras. Using headlamps, Patterson and a friend field-dressed the buck in the dark of early evening. As they did, they noticed two sets of what they believed were wolf eyes about 40 yards away. The observers gave no ground while waiting to move in on the remains. Scott Wudinich of Eveleth had a similar encounter some years ago while hunting near Lake Vermilion in northeast Minnesota. He shot a small buck from his stand, and shortly afterward climbed down and field-dressed the animal, before returning to his stand. He had ridden to the stand on a four-wheeler, and couldn’t legally operate the machine until after shooting hours. So he bided his time until nightfall. Wudinich fired his rifle several times in an attempt to scare away the wolves. But they remained about 50 yards from his stand. Uncertain what to do, he called the local conservation officer, who told him to leave the deer — which Wudinich did when he climbed onto his ATV at sunset and sped to his cabin about a mile away. Later, he returned with a nephew to retrieve the deer. “The gut pile was mostly gone and they (the wolves) bit into the hindquarters and neck and chewed on an ear,” he said. Because deer provide the bulk of a wolf’s diet, it’s no surprise hunters and wolves will occasionally bump into one another while seeking the same quarry, Mech said. Wolves average between 5 and 10 pounds of food intake a day, and individual wolves can gorge themselves on as much as 22 pounds of deer meat in a single sitting. While wolves usually present no danger to people, they’re constantly on the move, hunting. And if a wolf doesn’t totally consume an available meal in one sitting, he (or she) might bury the remains. “I can’t prove it, but I have circumstantial evidence that wolves will dig up food they buried as long as a year before,” Mech said. Wolves might prefer a fresh gut pile left by deer hunters, but if necessary they’ll eat rotted flesh. In British Columbia, we saw no wolves. Not while my guide field-dressed the moose. Nor while we rode to the trapper’s shack to gather the pack horses, or when we cached the moose’s quarters outside the shack.